FOR SALE: 1947 A7 Longstroke. (Project) "SOLD"
The hoop is 3/4". When I bought my bike it had a home made stay and was all wrong. Took ages to find the correct one, had to buy half an A7 in the end. Many thanks, I also have been looking for a while to no avail. The pictures and diameter will help. Have made various stays in the past and I am confident I should be able to knock off what is needed for this one. Likely will need to make a chainguard too as have no success finding one either. Vincent, there are two chainguards, a top run and a bottom. Have attached more photo's. If anyone is interested send me a personal message and I will provide a detailed description with further photo's if required. The bike appears to be fairly complete and will make a great project for restoration. As I said previously, any reasonable offer will be considered and I am sure an agreeable price for both parties can be reached. It would be a shame if this bike was not put back on the road. Any further comments or suggestions will be appreciated. Hi Russ, I've sent you a PM. Re: FOR SALE: 1947 A7 Longstroke. (Project) "SOLD"
This project is now SOLD. I would like to thank all members who contributed comments with regards to the value of this bike which made it very easy to reach an amicable price for both parties. The bike went to a fellow forum member. Well done Russ, it'll be a sweet project for the buyer. ps: better leave that for the new owner. Oooh I was so close, could have just about gathered the foldin' but didn't. I'll regret it! OOH Musky, you must have missed a couple of good hints. And sorry Wazza, when I showed MY wife the photos, her reply was,"yep, that looks right up YOUR alley". Anyhow she's going to make a great stable mate for my other rigid A7. This wont be too soon as I have just put a 53 plunger in the workshop (photo's soon). 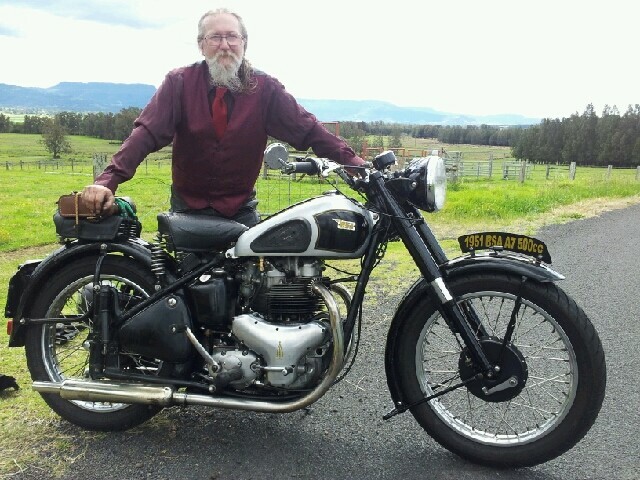 Huge thanks to Russ for helping to get this bike and me together, and your MATE will not be dissapointed, god bless. Thanks Peter, I have a bit of work to get this finished, but it's a great start to a 47 long stroke, most of the parts are there and I had the correct headlight. Here's a photo before I park it up for a bit, while the next one gets the resto treatment. Thomas that looks great. A vast improvement already on the "parts" we dragged out of the shed. I will show the photo to my mate, (Ken) and I am sure he will be impressed. Ooooh beautiful (though they never ever came out of the factory looking anything like that!!! Page created in 0.453 seconds with 22 queries.